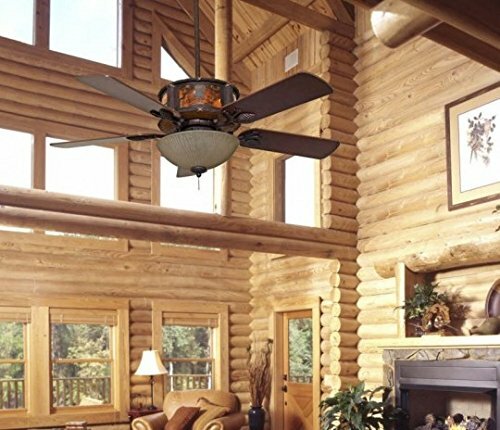 The right ceiling fans will improve the quality of life in your log home. They will keep you cool in the summer and allow you to run your air conditioning less by providing a light breeze that dispels the heat. In the wintertime, you can keep the fans running on low to help distribute the warm air in your cabin and keep everything feeling cozy. There are few things nicer than sitting in front of your cabin fireplace in the winter, with the warm air being gently circulated by an overhead fan. Using the above guide will provide adequate air flow throughout a given room without being too large or overbearing. If your room is on the borderline I would suggest going with the larger size cabin fan. Otherwise you may be running the smaller fan longer or at a higher speed to ensure proper airflow and the noise may be objectionable. Of course, these are rough figures as ceiling heights can vary greatly. On high cathedral ceilings in a great room, we typically mount our fans on 48" down rods since these 4-foot rods are the longest ones that are easily available. This leaves our fans about 8’ – 10’ off the floor. With multiple overhead fans in a large great room we’ll often run one fan blowing up in the winter and one fan blowing down to help circulate the heat and keep the overall room temperature even. If you have a steeply pitched cabin roof you may need to build angled boxes for mounting the overhead fans, although some cabin fans can accommodate angled mounts. The best blades are made of wood and acrylic. Blades should be mounted at a 12 – 15 degree angle. More than this and they can be loud. Less than this and they won't push enough air. Motor should have heavy-duty windings and sealed, permanently-lubed bearings for long life and quiet operation. Fans should be reversible so you can direct airflow down in the summer and up in the winter to aid in circulation of heat. If you're like me you can never tell which of the pull chains turns on the light and which one turns on the fan. Here's a simple way to distinguish them and you'll never have to try and explain to guests how to turn them on. 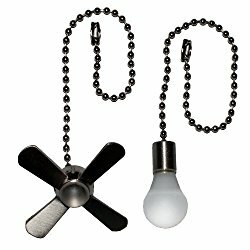 This cute ceiling fan pull chain set solves the problem of how to tell the difference between the light and the fan switch. Apart from these few technical details the only limitation on choosing overhead fans is your imagination. 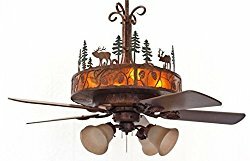 Cabin fans can have different themes to go along with your log home decorating, such as Adirondack, Western or Northwoods. You can go sleek and contemporary with gleaming stainless steel or go rustic with wrought iron and leather. 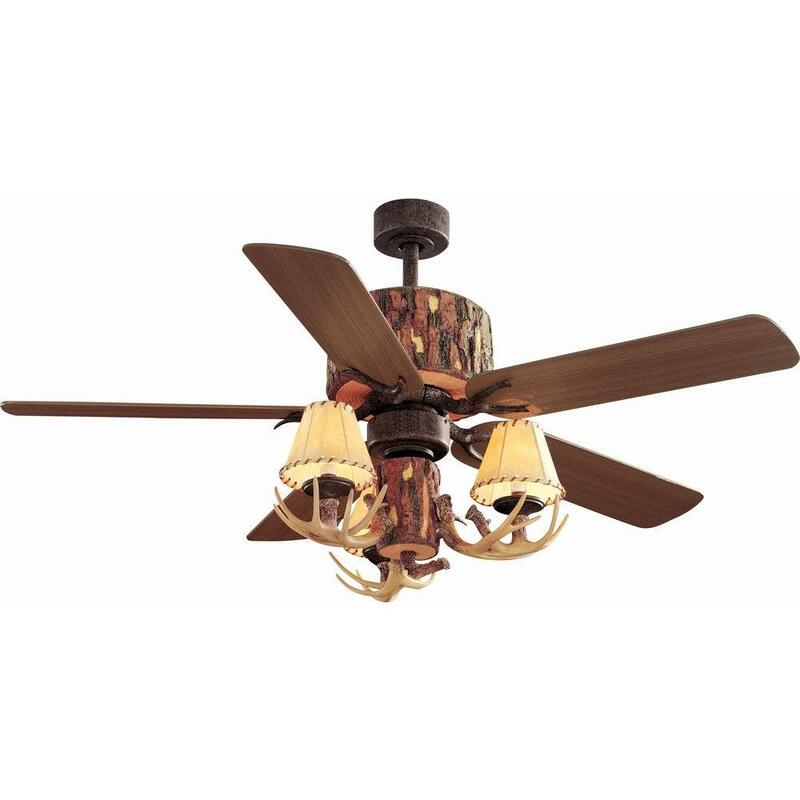 The right ceiling fans will set off your log home décor interior and provide you with years of enjoyment. Check out our page about log home interior design for more information.